Around 400 tech and engineering students from across Canada and the United States gathered at Concordia last weekend to participate in ConU Hacks, HackConcordia’s first iteration of a hackathon. HackConcordia is a student association whose goal is to provide resources and access to students who want to break into the tech industry, usually by organizing buses to out-of-town hacking events. This year, HackConcordia organized its own hackathon, which was held in the John Molson School of Business building. For students who don’t have a long list of engineering projects on their CV, a hackathon is a great way to create a piece of software or hardware in a short amount of time. They can also help people make connections in the industry. 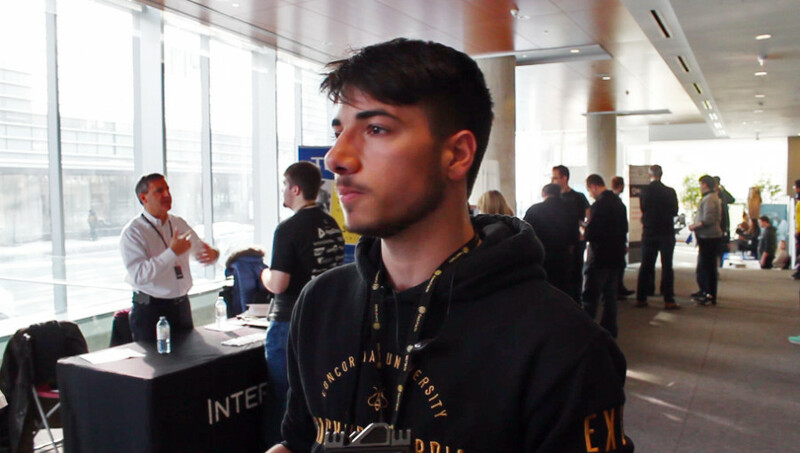 “It’s where hackers, coders, basically people who are interested in hardware or software who come together, form teams and work on things they’re interested in,” HackConcordia VP Internal Philippe Miriello said. Students at ConUHacks created projects that ranged from a file-sharing dropbox-type application for people not comfortable with computers, to a price-find application that takes the photo of an item to find its price on eBay and Kijiji, to a remote-control car. VP internal of HackConcordia, Philippe Miriello. 60 projects were submitted and judged by engineers based on originality, technical difficulty, societal benefit, and design. The winners were Joseph Szymborski and Ariella Smofsky, who developed a web app called DoubleVision. This software gives a “smart context” to a YouTube video by adding external information and links about any video’s content within seconds using image and speech recognition technology. The pair won tickets to the C2 Montreal business conference in May, and a Dell Venue 10 5000 Android Tablet per person. Hackathons are considered informal job fairs by sponsoring companies who provide software for participants to work with during the competition. Companies offer their code to participants who then come up with fresh software and hardware ideas the sponsors may never have thought of. The hacker community is all about collaboration and helping others learn. Beginners are welcome, and everyone can leave the event with a new engineering project under their belt. Anhelina Mahdzyar is a representative from Major League Hacking, the official student hackathon league. She has been doing hackathons since spring of 2015. According to Mahdzyar, anyone can learn to program or hack. During her first hackathon, she had no experience whatsoever but was able to build her first hack with the help of the many mentors around willing to help her. HackConcordia VP External Nima Jalalvandi said the association will “absolutely” be holding another hackathon next year.